GIRO d'ITALIA: MAY 7-29. I love this photo (found on Yahoo!) 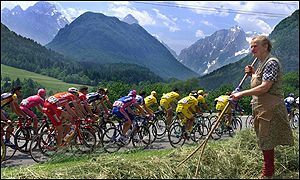 taken during the 2001 Giro d'Italia, or Tour of Italy. The three-week long "Giro" is the first of the three "Grand Tours" for the world's best cyclists. It is followed by the Tour de France (the grandest of all!) in July and Vuelta Espana (Tour of Spain) in September. FEW AMERICANS LAP THE BOOT. No, Lance Armstrong will not be racing in the Giro. But the Discovery Channel team will be well represented, with Tour of Georgia winner Tom Danielson gunning to wear the maglia rosa (the rose-colored jersey worn by the race leader). Chances of an American winning the Giro? Very slim. Only 5 Americans in a field of 198 racers. Danielson is a long shot. The best Yanks save themselves for the Tour de France. Typically, the Giro d'Italia and Vuelta Espana are affairs of national/regional pride. FOLLOW THE TOUR. I'll offer periodic updates on Bikehiker, but you can follow each stage live (if you can wake up early enough!) or get daily stage results and photos at www.cyclingnews.com or www.velonews.com. If you haven't followed a multiple-stage cycling race, it's quite interesting via the Internet, even without TV or video.